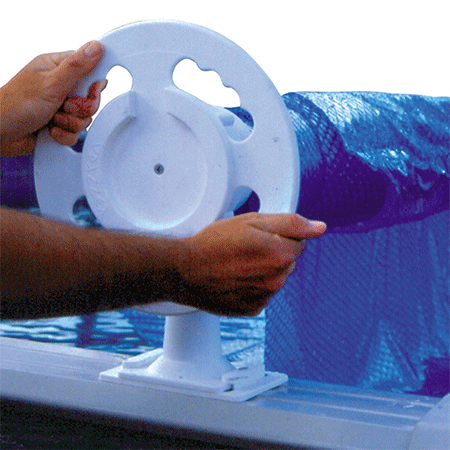 A swimming pool cover reel is used to aid in the removal and placement of the solar cover for your pools. These reels can be freestanding or mounted. They can also be made of different materials such as aluminum, plastic, or stainless steel. It’s important that users find the best reel for their specific needs. Some reels may be specifically for an in-ground pool while others are designated for above ground pools. 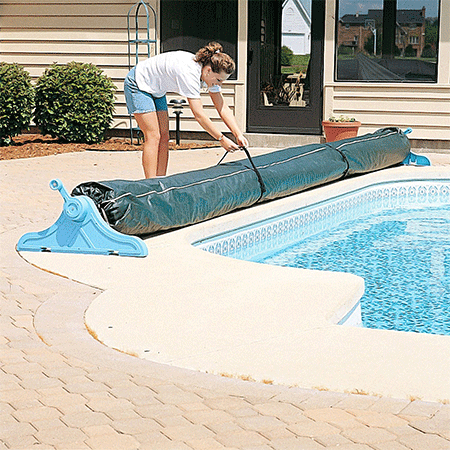 Some cover reels may even be used for for both in-ground and above ground pools. 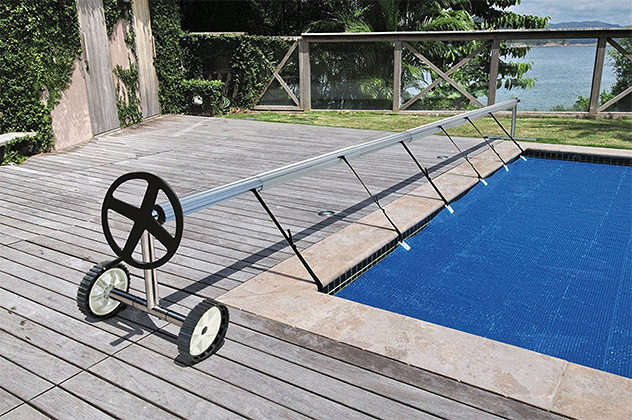 The Deluxe Low Profile Solar Reel is make for pools from 12 feet up to 16 feet. It is triangular shaped to help stabilize the reel and keep it from tipping over or falling into the pool. All the necessary parts are included so there will be no added costs for this product. It is stated that it is a one person reel, however many user have stated that it is much easier to operate with two. It has also been a concern that the reel is a little small for 16 foot pools. There are no sharp edges on this reel which helps to preserve the life of your cover. The Kokido Alux Aluminum Pool Cover is a very aesthetically pleasing reel. It is definitely not an eyesore like many reels can be. It can be used for cover up to 21 feet, and features large locking wheels that make it easy to roll away when needed, but it can also be kept in place so there is not movement when trying to roll up your cover. The reel is complete with a hand crack to assist the user in rolling up the pool cover. 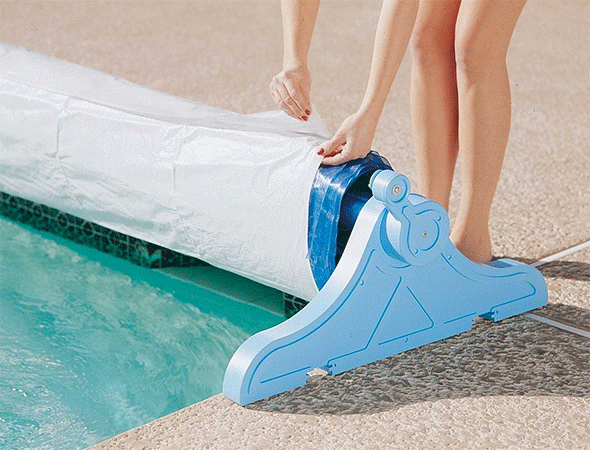 Users have noticed that the tube holding the cover bows when the pool cover is completely rolled up. The Poly Tarp Solar Reel Protective Cover is a vinyl cover that allows you to protect your solar cover while on the reel. 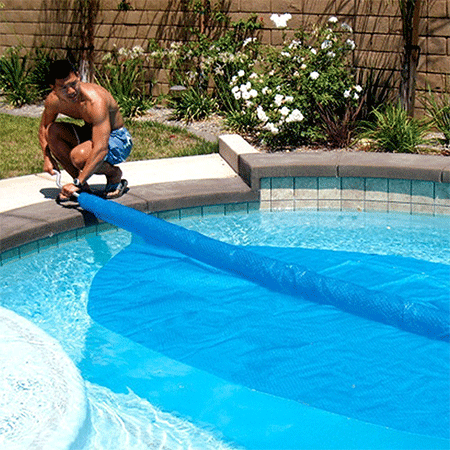 It measure 40 inches and can be used on solar covers up to 28 feet so it is plenty large enough for most pools. User say it is very durable, however, the used to close it is not strong enough to hold the cover on the pool especially when wet. The Doheny’s Deluxe Over the Ground Solar Pool Cover Reel System is a reel that can be installed directly on the pool wall or deck. 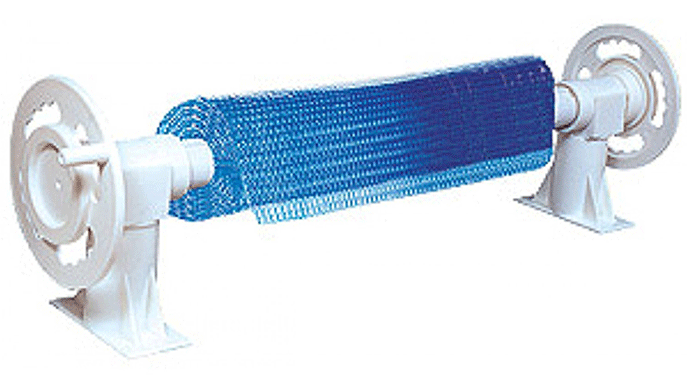 It has the ability to be swiveled away while to pool is in use so it does not take up room in your pool. It fits pools up to 18 feet and can be used for round or oval shaped pools. This cover reel is very durable and well-made, but the instructions are very basic and hard to follow. 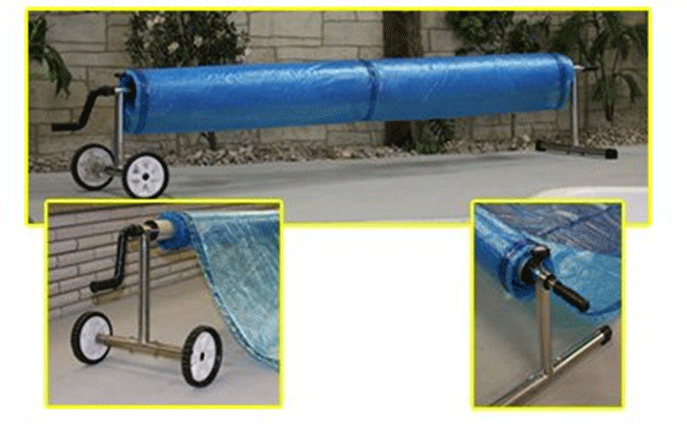 The 18 ft. Winter Cover for Pool Solar Reel and Blanket allows you to leave your reel and solar cover outside even during the winter. It zips up and is waterproof to completely protect your cover and reel from the elements. 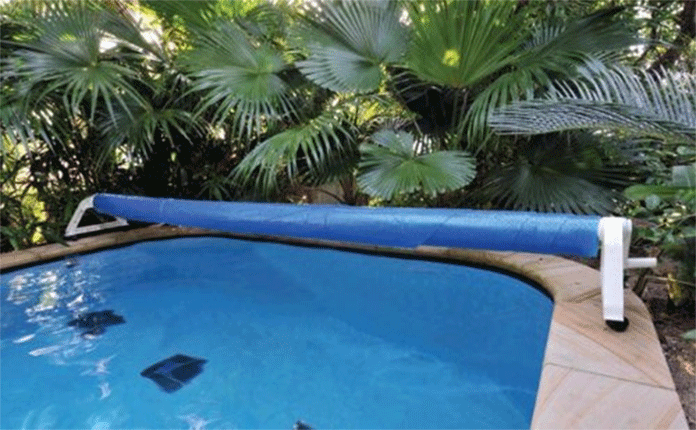 It can fit pools up to 18 ft and is made of a durable vinyl material, however, some have found it to be too short. The Kokido APOLLO In-Ground Swimming Pool Cover Reel is an aluminum reel with plastic accessories. It fits cover up to 19.5 feet. The reel can be directly installed to the deck to make for more stability. The reel is resin covered which keeps the product from rusting. The plastic parts are not as durable so they may crack when holding heavier covers. The Kokido Solaris Above-Ground Swimming Pool Cover Reel is an aluminum reel made to be attached directly to the side of your pool. It can fit a cover of up to 18.6 feet. The reel is anti-rust which makes it longer lasting. It also feature a crank to aide in rolling up your cover. Users have stated that the plastic becomes brittle from being in the sun and the directions are not detailed enough. 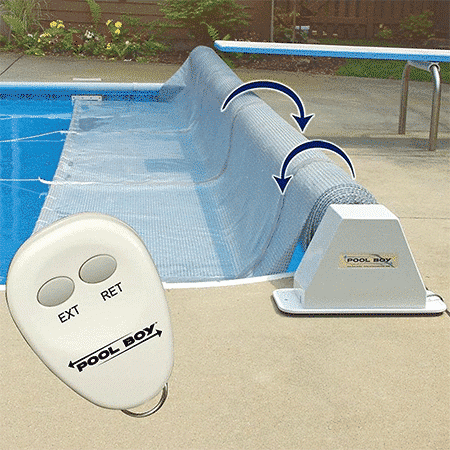 The Powered Pool Solar Blanket Reel by Pool Boy is an electric reel which allows you to roll up your reel with the push of a button. It can fit a solar cover up to 20 feet and includes a floating remote so you never lose your remote to the bottom of the pool. This cover reel made of aluminum for lightweight durability. It also features manual override in case the motor ever fails. It is a process to set up, but once you do it takes very little time or effort to use. The Above Ground Solar Reel” by Leisure Living is an aluminum and plastic reel that can be attached to your pool or deck. It can fit pool covers 24 feet and smaller. The poles are 3 inches in diameter for plenty of durability when holding the entire solar cover, but many users have found that the instructions are not detailed enough to figure out how to use put together the product. The Rocky In Ground Reel is made for pools up to 20 feet wide. 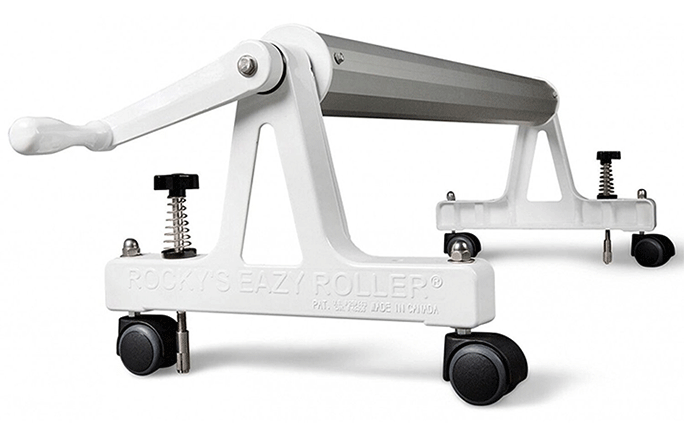 It is attached to castors to for easy roll away when it is not being used. It is made from aluminum with an enamel finish to keep the aluminum from rusting. The inner tubing is 3 inches in diameter which helps with durability when the solar cover is rolled up. Some users found it difficult to assemble. Castors make for easy roll away when not in use. 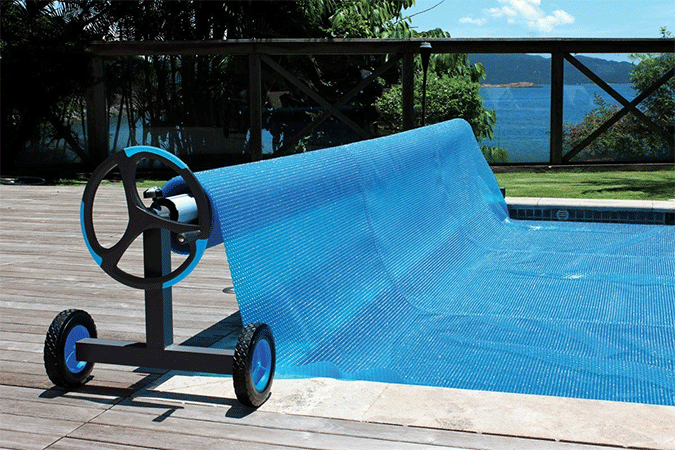 The Solar Roller is a reel that allows you to roll a cover for an in-ground or above-ground pool. It rolls from the middle which takes the strain off of the cover and helps to extend your product’s life. It does not have to be connected to anything so there are no holes drilled into your pool or deck and can be moved away when not in use. The roller is kind of flimsy and can break after a while. The Sun2 Solar Stainless Steel Frame Reel is a durable reel that is made for pool cover up to 20 feet. It has large wheels for easy maneuverability. The inner tube is 3.25 for added durability when holding the cover. It has a large clearance from the ground so your cover will not drag. Some have said that the straps included are difficult the figure out, although initial set-up is simple. The ARKSEN Solar Cover Reel is a stainless steel reel for pools 20 feet or smaller, however it is reported that the cover does not work well for pool covers over 16 feet. The wheels allow the reel to be moved out of the way quickly and easily. 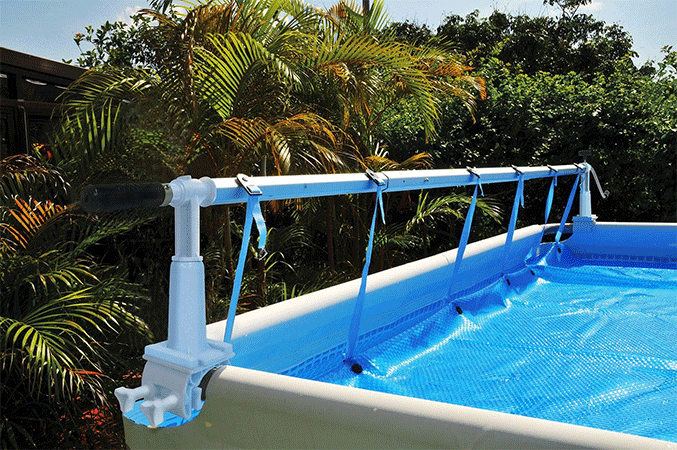 It can be used for above-ground or in-ground pools for added convenience. Can be used for above or in-ground pools. The Kokido Stainless Steel Reel is made for pools 18 feet or smaller. It is made from stainless steel for a rust free finish and durability. It includes straps to hold the cover in place and a crank for ease of rolling up the cover. The reel has been know to easily strip screws which makes it difficult to keep together. 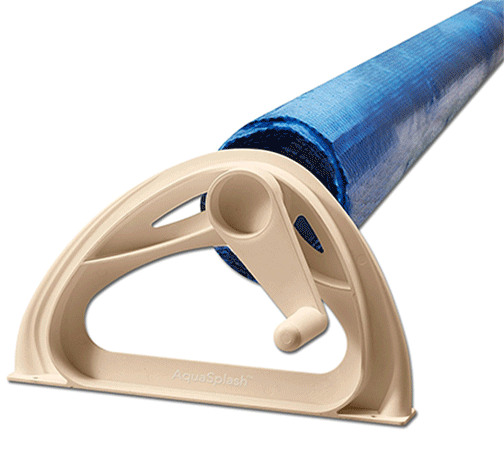 The Aqua Splash Swimming Pool Solar Cover Blanket Reel is a versatile reel that can be mounted or freestanding. 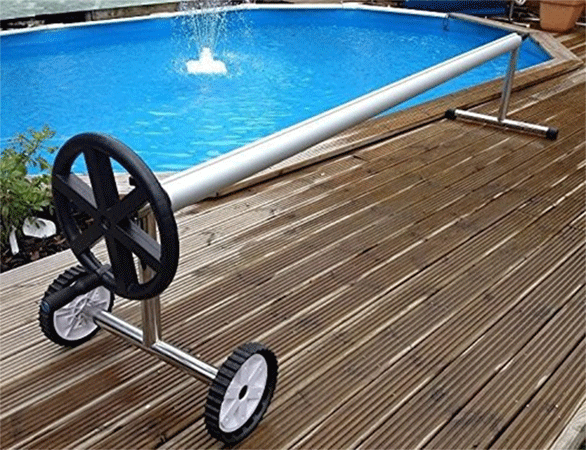 It can fit pools up to 16 feet and includes a hand crank for easy rolling up. Users have said that it is difficult to put together and it has durability issues. The sides of the reel fall off on occasions.